RIR presents a special review of reports from Russian media on the pro-democracy protests taking place in Hong Kong, featuring analysis from several leading publications. The daily Kommersant reports that the civil unrest in Hong Kong, which has been dubbed the ‘Umbrella Revolution’, is becoming a serious thorn in the side of the Chinese authorities, who have proclaimed their strategic tasks to be uniting the “Chinese world” and building a mighty China. “Hong Kong’s political culture, which was formed under British influence, significantly differs from the political culture of Communist China,” said Dmitry Mosyakov, head of the Center for South-East Asia, Australia, and Oceania at the Oriental Studies Institute of the Russian Academy of Sciences. “Liberal traditions have solidified here over the course of decades, as a result of which freedom and a Western lifestyle are a much greater value for residents of Hong Kong than they are for Chinese citizens,” Mosyakov told Kommersant. In his opinion, it would set a dangerous precedent for Beijing if the Chinese authorities were to yield to the pressure of the protesters and agree to reform electoral law. “Shanghai and other Chinese regions might follow in Hong Kong’s footsteps with similar demands,” Mosyakov said. In this case, the Chinese authorities have no other choice but to wait for the ‘Umbrella Revolution’ to die down without making any serious concessions. If the protests do not let up, they will have to use force to “restore constitutional order,” he said. “Is Beijing being hasty by limiting Hong Kong residents in its reforms of the electoral system?” asks the Moskovsky Komsomolets newspaper. The publication discusses the topic with Andrei Vinogradov, director of the Center for Political Studies and Forecasting at the Far East Institute of the Russian Academy of Sciences. 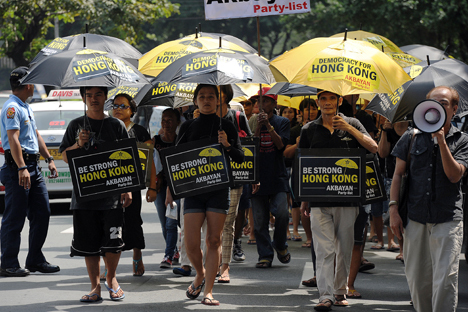 “When it was decided that Hong Kong’s way of life would not be changed for 50 years, it was understood that its vector was clear – the administrative region should move closer to mainland China,” Vinogradov said. Regarding the future of the protests, Vinogradov pointed out that the demonstrations were not the first unrest Hong Kong had seen that was associated with the political situation and elections. “The last time something like this happened was at the beginning of the last decade,” he said. Beijing will manage to reach an agreement by using various levers, said Vinogradov: “There are a diversity of business communities in Hong Kong that are interested in maintaining ties with mainland China,” he said, adding that even if things come to mass unrest and clashes, the Chinese authorities will maintain control over the situation, as it did in 1989. Rossiyskaya Gazeta quotes the opinion of Alexei Maslov, head of the Oriental Studies Department at Moscow’s Higher School of Economics, on the protests in Hong Kong: “Right now Beijing needs to make sure that no one questions its abilities by quickly and rigidly resolving such situations, while at the same time not destroying its traditional image as a wise and understanding leader,” he said. Maslov believes that China’s desire to avoid fanning the flames of protest means it is unlikely to take any drastic steps such as calling in the army. “Beijing is worried that the situation will spin out of control and spread to the neighboring regions in southern China, primarily Macau, which is also a separate administrative region. So Beijing will strive in every possible way to limit itself to the use solely of police forces, which are beautifully trained, disciplined, and know how to act tough,” Maslov said. According to him, many Hong Kong residents were upset by the city’s return to China without a referendum. “That’s why several of the city’s residents were offended by the transfer. All this time, they have retained sympathy for the structure they had under the Britons. That tension has built up over all these years, and now it has boiled over,” Kizima said. “Beijing also can and should be understood. China does not want Hong Kong to experience serious problems created by the election of a pro-Western political leader by a pro-Western population. In general, the residents of Hong Kong need to get used to the fact that they are Chinese and to learn how to share the values propagated throughout mainland China,” he added.